Another of the leading names in the world of Italian boat building, another company that contributes to the growth of the interest in our large boats being manifested by the international superyacht market. We are referring to Cantieri Navali di Lavagna, perhaps better known by its acronym, CNL, owned since 1979 by the Ceccarelli family. 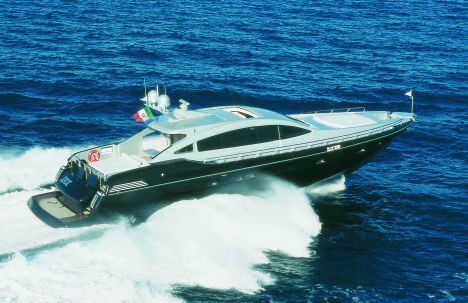 The Ceccarellis also own the Cantieri Navali di Riva Trigoso, another famous name in the world of Italian pleasure boats, acquired in the '60s by Aldo Ceccarelli (who was also the chairman of UCINA - the National Union of Shipyards and Nautical and Related Industries - from 1977/78 and from 1983 to 1993). Two brands and hence a small group that is conceptually very different from the industrial model that has proved successful for other Italian holding companies. Although these two shipyards are among the top in the country, their success is based on craftsmanship, tradition and maximum personalization of their motoryachts. Speaking with Mr. Succio, who is in charge of the CNL shipyard, we were interested in learning more about this Ligurian company and its strategies, techniques, etc. The principal technical characteristic of your boats is probably the fact that they are built of aluminium. When did you build the first boat with this material? As soon as Mr. Ceccarelli acquired the shipyard, give or take a month. The year was 1980 and I do believe that we were the first shipyard in Italy to build boats using aluminium. Other companies then tried using it, mostly with unsatisfactory results, while some, such as CNL, were more successful. We became very experienced with this material and, in the relatively small but important market niche of aluminium superyachts, we became a point of reference for owners both in Italy and abroad. So you acquired considerable know-how in this sector. Certainly, as is clearly demonstrated when our boats are in the water. Products can be designed on paper, experimented with in laboratories, invented and put on the market. Other products are the result of daily, hands-on experience, knowledge of boats and of their natural element, the sea, and this is a plus that qualifies the product beyond measure. What are the advantages of this material? Aluminium construction has many major added values, among which, I believe, is the fundamental advantage of being able to customise the boat for each individual customer. This enables us to translate the customer's perception of luxury, of lifestyle, into a unique product. Often, however, the term "custom" is misleading because boats are publicised as being very personalizable but then one realises that only the upholstery, and very little else, is changed. As of the moment when the customer decides that he wants one of your boats, what is the construction procedure, how does it start? First of all, we have to understand, from the outset, what the customer's requirements are. What relationship and what approach he has with respect to the sea. 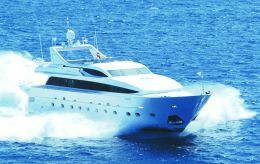 Whether he is a person accustomed to spending most of his boat time in the marina or anchored in bays, whether or not he needs to have many guests onboard, whether he needs particular attention paid to personal security, whether he needs special technology so as to enable him to continue to practice his profession onboard. This is the kind of screening we go through with our customer, after which the Admiral Style Center prepares a series of hypotheses which are gradually developed and perfected so as to reflect the customer's requirements. This process of refinement involves innumerable drawings and tests. The customer is invited to the shipyard, where he can see other boats being built, thus giving him the chance to understand better what his own requirements are, perhaps inspired by what we have already done. We thus create a kind of laboratory of ideas in which various concepts are compared, discussed and developed until we arrive at the final project. Obviously, all of these aspects are combined, taking into consideration the fact that there is one overriding restriction: the boat's dimensions. Given an equal length, they have the widest beams on the market. And this is one of the added values I was referring to, made possible by aluminium construction. On the average, our boats' beams are a half-meter wider than those of our competitors, which is an enormous figure on a boat. When you consider a half-meter over 40 meters of length, multiplied by three, you have a huge amount of liveable space, almost equivalent to an apartment. Is the customer free to decide how to use the interior space or do you impose certain restrictions? Including in your work with aluminium? Certainly, it suffices to look at how the shapes of our boats have evolved. Today, we are able to create boats with rounded angles that were unimaginable a few years ago and that are comparable to those achieved on superyachts built of composite. We are able to shape this metal the way we want because the cuts are increasingly precise, the welding no longer deforms the panels, etc. And all of this makes filling and various kinds of carpentry work unnecessary, improving the product and speeding up the construction process. The use of aluminium alloys makes your boats lighter than boats of composite. Do you use this advantage in order to offer faster boats or in order to install slightly smaller motors? The reduction in terms of weight is appreciable particularly with larger boats. We estimate that for boats of up to approximately 27 m, aluminium is not particularly advantageous. It becomes an advantage beyond 27 m, with our boats usually faster than the average. Usually, we equip 31-m boats with 2200 HP motors, 33-m boats with 2700 HP motors, and we are therefore certainly not below the competition in terms of power. The rest is done by the CNL bottoms, proven effective after years of service and which do not sacrifice their confirmed qualities of stability and seaworthiness in exchange for market-driven "performance". Will you tell me something more about the CNL bottoms? Basically, we have three types, all very different. One is used for 25/28-m boats, one for the 31-m and one for the 33-m. The latter has a more accentuated stern angle because we want it to be reliable in any sea conditions without sacrificing speed. Our best sales have been with customers with whom we have been able to test the boats in full sea, when the true value of CNL bottoms can be appreciated. Turning now to your new 40-m boat, what is it like? We wanted to create a two-faced boat, if you will permit me to coin a phrase. That is, a boat that could reach a very respectable speed, around 26 knots, while still being totally comfortable, even at headings typical of displacing yachts. This is why it has a chine bottom, slightly modified astern, so as to ensure excellent response at even low speeds. For the "Challenger", on the other hand, we designed a special bottom because of the hydrojet propulsion. Then, we sought to support the intrinsic characteristics of a large open boat, that is, performance and ease of handling, precision at the rudder and, obviously, comfort. Why did it become necessary to offer an open boat? The competition is extremely fierce. We made our choice in order to respond to the market but also in order to challenge ourselves, to test our abilities, which is why we called the new boat "Challenger". Objectively, our business remains centred around the fly, as is demonstrated by the launching of this new 40-m, three-deck boat. The "Admiral Challenger" is something that is growing and that will gradually also become a point of reference. Are you thinking of creating a limited range of perhaps even larger open boats? Yes, we are now thinking about a 120-footer. We are continuing to move in the direction of open boats because we believe very strongly in our product. As far as I personally am concerned, I start from the principle that the marketing is done first and then the product is built, and so, today, we are marketing this type of boat so that it will be perceived as a quality product within its context. This does not happen automatically, it requires time, which means that we are moving very quickly. Have you considered a "Challenger" with surface propellers? It is something worth considering because, compared to the bulk and location of hydrojets, surface propellers could let to gain space belowdecks. However, above and beyond the exterior aspect, which would remain identical, it would be necessary to redesign the boat almost completely. In order to work well, different propulsion systems must be studied and designed specifically. And then, it always depends on the level of approximation one wants to work with, everything can be done according to the "make it or break it" concept, moving confidently from surface propellers to hydrojets, but this is not the way we work. "Challenger" was designed specifically for the type of propulsion used and this influenced the angle of the "V", the centre of the bottom, the positioning of the bulkheads, the balancing of the weights, etc. A change in propulsion changes all of these and many other of the boat's technical aspects and, according to us, all of this must be taken into consideration. The new Admiral 31 was launched on 15th May at the Cantieri di Lavagna, being their job order number 108. It is a modern and sophisticated yacht featuring advanced design and a layout capable of ensuring high standards of comfort. As is the case for all CNL's creations, the new Admiral is made of alloy and was developed specifically to meet the owners' requirements.